The airline carried 2,128,835 passengers in July, an increase of 17 percent compared to July 2012. The load factor was 86 percent, down 1 percentage point from July 2012. The traffic figures are influenced by the exceptionally good July weather in the Nordics, contributing to less demand for travel to The Mediterranean. The total passenger traffic (RPK) increased by 29 percent and the total capacity (ASK) increased by 30 percent. 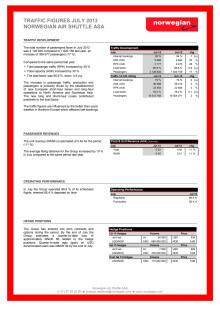 “I am pleased with this month’s traffic results. We continue to report good figures in our established markets; in addition, the response on routes out of our new European bases and on our long-haul operation has been very well received. 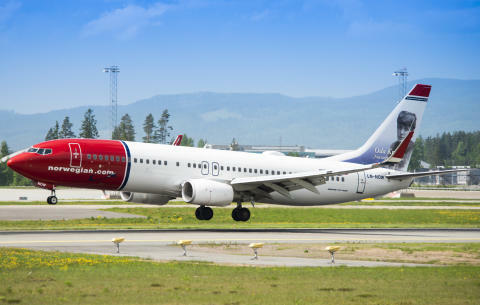 The fact that more than two million passengers have chosen Norwegian in July proves that high quality at a low fare is appreciated,” said Norwegian’s CEO Bjørn Kjos. The company operated 99.9 percent of its scheduled flights this month, whereof 85.4 percent departed on time. Norwegian Air Shuttle ASA, commercially branded “Norwegian”, is a low-cost airline listed on the Oslo Stock Exchange. Norwegian is the second largest airline in Scandinavia and third largest low cost carrier in Europe. Close to 18 million passengers chose to fly on its network in 2012. Norwegian has a route portfolio that stretches across Europe into North Africa and the Middle East, as well as long-haul flights to the US and Southeast Asia. The company has a total of 382 routes to 121 destinations on sale and employs approximately 3,000 people in Norway, Sweden, Denmark, Finland, Estonia, UK, Spain and Thailand. The company has 275 undelivered aircraft on firm order. Norwegian was founded in 1993 and its headquarter is in Fornebu, Norway. In June 2013, Norwegian was voted Europe’s best low-cost carrier of the year by the renowned SkyTrax World Airline Awards. Norwegian offers better leg room than most competitors, in-flight WiFi, world-class punctuality and a fleet of 75 aircraft with an average age of only 4.6 years.